Institute of Cost & Management Accounting (ICMAI) holds CMA Foundation, Inter & Final exam each year twice in the month of June & December. Next ICWAI exams will held in December 2016, and now you can download admit card of ICMAI Foundation, Inter & Final December 2016 exam from below said site. Here I have given information about Admit card issuance date for upcoming CMA December 2016 exam. 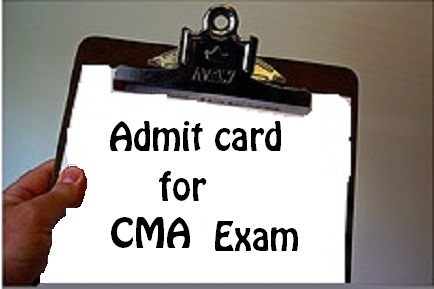 Admit card / Hall ticket is the only document which will allow you to enter in the exam hall & let you write the upcoming CMA/CWA exam. Enter your Registration No. their to download ICWAI admit card Dec 2016 exam. ICWAI Foundation Admit card will be coming on site given below. Stay tuned with us for the updates about ICWAI Foundation April 2016 admit cards. Get this too: CA CPT Admit Card December 2016. And, you should subscribe to our free mail updates to get notified when ICWAI admit card December 2016 is available for download and we will notify you by mail. For more information and updates of ICWAI/ICMAI CWA / CMA Foundation, Inter & Professional Admit card updates & details, subscribe to our free mail updates from below box. The link is not working.. it shows june 2012 admit card details. This is the link where ICWAI will give admit cards. The link will be updated soon, I hope so. The link on the CWA website is not working for past several days… I have been checking it regularly…. Is there any other way to get the admit card? CPA Training by Orbit Institutes in India. CPA Courses to get Qualified Certified Public Accountant Examination, Trained Certified Public Accountants coaching classes if you want become CPA USA. Certified Public Accountants Classes, CPA Training, CPA Institute, CPA Course, CPA USA, Certified Public Accountants Training, CPA Course in India. The link on the CMA website is not working how can we download our admit card?? ?